What makes a successful mentoring relationship? This is how senior sport management major Lindsay Beer described her mentorship through the University of Delaware’s Lerner College. As the business community increasingly recognizes the value of mentoring as a means of developing both leaders and the future workforce, the Lerner College developed the Executive Mentors Scholars (EMS) and Graduate Executives Mentors (GEM) programs. Managed by the Lerner Career Services Center, these programs establish one-on-one relationships between students and their mentors, who have at least 10 years of experience. The students receive guidance and professional development while building and strengthening their networks. In this year’s cohort, 65 mentor-student pairs were recently introduced through the EMS program, setting a new record for the total number of matches at 180 pairings. In a recent survey, 90 percent of participant respondents rated their overall program experience as good, very good, or excellent. Jill Gugino Panté, director of the Lerner Career Services Center, says the mentoring program is one of her favorite aspects of her job. One such student is junior finance major Amanda Flores, whose mentor is Hiroko Sproesser, a business process consultant at Agilent Technologies. Flores described their relationship: “We meet once a month… in person or over an online web portal, and email more to keep each other updated. She has been very helpful with me doing mock interviews throughout my internship application process. “What excites me most about this program is getting to build a strong relationship with my mentor and getting one-on-one professional personal advice,” Flores continued. 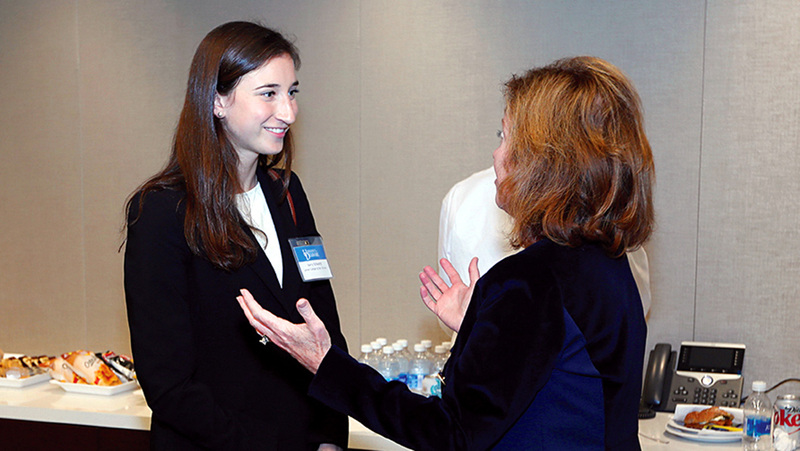 Last fall, students and mentors engaged in several developmental activities, including lunch and dinner meetings, mentors introducing their mentees to colleagues, mentees visiting mentors’ workplaces and informational/mock interviews. So what makes a successful mentoring relationship? The survey asked both mentors and students to share a beneficial development activity or best practice on their survey response. Mentor best practices included items such as setting up students to shadow mentor at offices, changing up meeting venues and creating goals for the program. “Mentors need to listen, listen and listen to their mentees; be a coach, not a preacher,” said Peter Saitis, chief financial officer of Ecore International, Inc. and mentor to junior management information systems major Emma Lavelle. Kathryn Fuchs, an MBA student in the GEM program, said that her GEM experience provides valuable recommendations and constructive professional advice. “I am excited about the unbiased, battle-tested feedback on my experience and career trajectory, along with suggestions that come from someone who has an idea of what it takes to build a successful career on my chosen industry,” Fuchs said. Applications for the EMS program will open later this spring. All applicants must be enrolled in the Lerner College and must be sophomores when applying. The GEM program accepts applicants in the fall. Check out the Lerner Career Services Center web site for additional information about the mentoring programs.